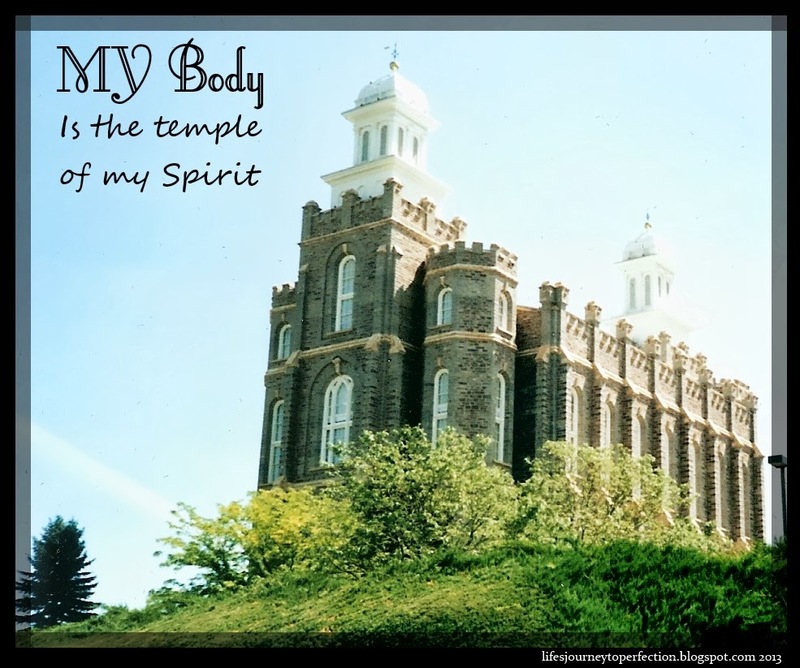 Life's Journey To Perfection: Family Home Evening- My Gospel Standards- I will keep my mind and body sacred and pure, and I will not partake of things that are harmful to me. 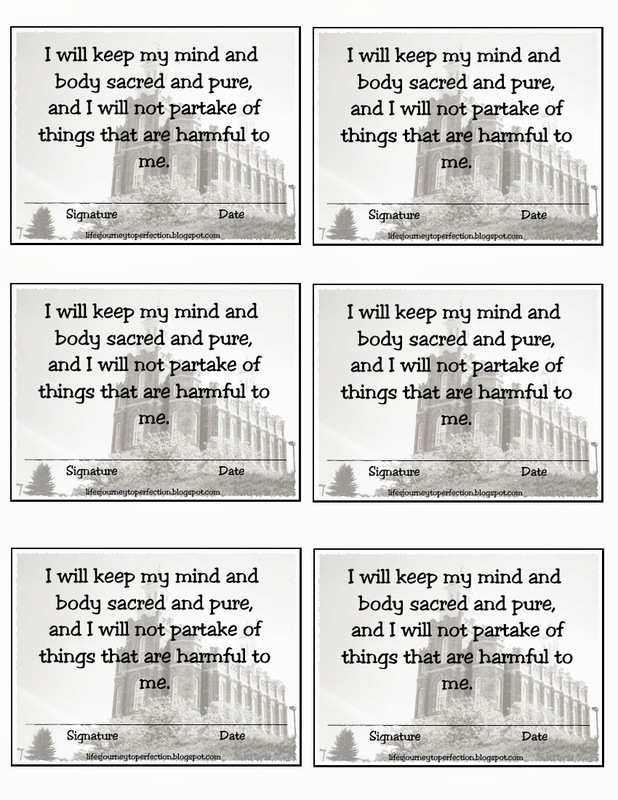 Family Home Evening Outline for: I will keep my mind and body sacred and pure, and I will not partake of things that are harmful to me. Discuss with your family why our bodies are sacred and why we should keep them pure. Ideas might be: Our body is the temple or home of our spirit. It is something that our Heavenly Father has given us. We should be modest when we wear our clothing to show respect to our bodies and our appreciation to our Heavenly Father for our bodies. Show them this picture for only 5 seconds, then put it away. Ask each family member to close their eyes and describe the picture they had just seen. Discuss as a family that even viewing an image for a short amount of time our minds still remember details of that image. We should avoid looking at immodest pictures and things, to keep our mind pure. Once we have seen an image it is very difficult to get that image out of our head. The Holy Ghost can not dwell where there are unclean things. Discuss with you family what the guy in the story was blessed with, because he kept the Word of Wisdom. Explain that we should not allow harmful things into our bodies. Discuss some harmful things we should avoid. (see "Word of Wisdom" on Lds.org). What are we promised when we obey the Word of Wisdom? Make the decision NOW! So, when you are faced with seeing an inappropriate photo or are offered something harmful to your body you will have already had made the decision to not view the photo or partake of the harmful thing. Have each family member read the Promise card and make the commitment to keep their mind and body sacred and pure, and not partake of things that are harmful to them. Then have each family member sign and date the card. Help younger children do this. Have them keep the card in a spot that will remind them of their decision and promise. Bear testimonies on keeping our minds and bodies sacred and pure and not partaking of things that are harmful to us. Have either kabob sticks or tooth picks on hand. Let each family member make their own fruit kabob.